There are riches to be found inside mountains of patient information, but at what cost? The relationship is young, but healthcare has embraced “big data” as a solution to many of the cost, quality, and safety issues that plague patient care. In particular, larger academic medical and health systems are applying analytics to massive volumes of patient data, performing predictive modeling, and identifying clinical risk factors, utilization patterns, population health trends, and much more. Few will argue that big data can bring value to healthcare. The question for many is just how high that value will be—and at what cost. “I don’t know if we have a good sense yet of all the value that big data will bring to healthcare over the years. Some early indications, especially around safety and optimizing healthcare organizations from an operational perspective, are that it holds a lot of promise,” says Jeremy Maxwell, vice chair of the EHR Association Privacy & Security Workgroup and an application security architect with Allscripts. The true potential of big data lies in its ability to reveal patterns and trends that will enable healthcare organizations to deliver better care at lower costs. Its use for business analytics also helps drive more informed decisions on resource allocations and service line and other investments. But what is the value of those benefits? According to a May 2011 report from McKinsey Global Institute, the answer is $300 billion. That is the amount researchers say will be generated by the creative, effective use of big data by the US healthcare industry. Two-thirds of that amount would come from an 8% reduction in expenditures. Some are skeptical of those figures and unconvinced that patients will benefit more than tangentially from big data’s application in healthcare. Peel and other privacy advocates charge that the only true beneficiaries of big data as it is currently managed are the organizations selling and mining the information. Indeed, IDC reports that the big data business generated more than $30 million in revenues in 2011 for companies with extensive data-mining experience. The firm further predicts big data will hit $34 billion in 2012, driven largely by its increased use within healthcare. Peel says the value of big data to healthcare businesses appears to be unlimited. However, it is consumers who will pay the price unless informed consent is secured for all data collection and use. She notes that US patients currently have no control over how their data are used or what information can be gleaned from them and sold to employers or others who may use them for negative purposes. As evidence, she points to a survey conducted in 1999—when most medical records were paper—that found 35% of Fortune 500 companies looked at medical records before making hiring and promotion decisions. Some brush off data privacy concerns as overblown or even outdated, particularly with the strengthening of many aspects of the HIPAA rule under the HITECH Act and the stringent security requirements under meaningful use. However, unauthorized disclosure of protected health information (PHI) remains a serious issue. According to Redspin, a security audit company, the total number of patient records breached increased 97% between 2010 and 2011. In all, more than 19 million patient health records have been breached, with the average number of records per breach increasing by 80% in 2011 to nearly 49,400. Ninety-seven percent of the healthcare organizations that participated in a survey from the Ponemon Institute reported suffering a data breach in the previous two years at an annual average cost to the industry of $6.5 billion since 2010. The most common causes for the breaches were lost or stolen equipment, errors by third parties, and employee mistakes. It is a trend that some say will continue as big data makes greater inroads into healthcare, an industry that has failed to adequately protect its small data despite widespread availability of affordable, user-friendly encryption and other security technologies. Peel also points to the Consumer Privacy Bill of Rights, which focuses on delivering data privacy protections to win consumers’ trust in technology but specifically excludes healthcare data. “Health data security is abysmal, and 80% of health data is not even encrypted. More large databases plus ever more widespread secondary and tertiary uses of data will equal a massive, exponential increase in data breaches,” says Peel, adding that not only is insufficient attention being paid to protecting PHI in an era of big data, but consumers are woefully uninformed about the risks of electronic systems. There are several ways to keep breach predictions from coming to fruition without lessening the potential value the healthcare industry can realize from big data. It is possible to “maintain data so useful access is preserved while maintaining security. There is a lot of room for innovation,” Maxwell says. The key, he says, is to follow industries such as banking and finance that long ago found the right balance between big data security and usability. The foundation is a multilevel approach. For example, most banks have security alarms on doors and windows, armed guards, time locks on safes, security cameras, and teller-activated entry-point mantraps and distress buttons. Healthcare organizations that wish to benefit from big data also must accept the fact that stellar security is the price of entry. They must be willing to invest in a minimum set of controls and be ready to adapt to the changing security and privacy landscape. It is no longer sufficient to deploy what Maxwell dubs the M&M model of security: a hard shell of perimeter security wrapped around a gooey interior protected only by soft user policies that don’t provide adequate controls. Firewalls and virtual private networks are no longer enough. McGraw recommends avoiding the single point-of-failure risk by utilizing a distributed network when big data is being aggregated from multiple locations. She also advises using data in their least identifiable form to maintain usability. Peel notes that deploying state-of-the-art, comprehensive, and meaningful data security and privacy protections for big data will go a long way toward establishing a higher level of consumer trust in how PHI is being used. Establishing that confidence will ensure that the entire system—patients included—will be able to realize the full value of big data. 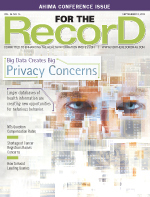 Does Big Data Require a HIPAA Redo? Between the rise in patient data breaches and the momentum big data is gaining in healthcare, some question whether HIPAA has what it takes to keep pace with a rapidly evolving HIT environment. Does the law need a makeover? According to Deven McGraw, director of the Health Privacy Project, what is needed is not an overhaul of HIPAA but rather some guidance for healthcare organizations on how best to comply with what is a complex set of regulations. In fact, she says the Office for Civil Rights, which enforces HIPAA, has indicated an interest in providing more concrete guidance for healthcare organizations and is currently taking suggestions on an informal basis on what that guidance would entail. Do you know where your data are? For the vast majority of US healthcare consumers, the answer is a resounding no. “In the US, there is no chain of custody for any sensitive personal information and no way to control who gets it. There is no way to track or prevent the flow of health information to hidden data users and thieves,” says Deborah C. Peel, MD, founder of Patient Privacy Rights. That is why Patient Privacy Rights has teamed up with Latanya Sweeney, PhD, founder and director of the Data Privacy Lab, part of Harvard University’s Institute for Quantitative Social Science, to develop theDataMap (www.thedatamap.org). The project is enlisting consumers, technology experts, whistleblowers, and geeks to act as “data detectives” to report and vet hidden health data-sharing arrangements. Peel says it’s a way to map hidden data flows and ultimately reveal how everyone’s personal health information is being used and exchanged by the various organizations that hold it. The hope is that theDataMap, once launched, will reveal how data are being used and by whom so patients can regain control.